Performers include: Edward Burns, Michael Rapaport, Elizabeth Masucci, Katrina Bowden, Ruben Santiago-Hudson, Wass Stevens, Keith Nobbs, Austin Stowell, Patrick Murney, Lyndon Smith, Brian Wiles, and Cormac Cullinane. Set in the Early 1960s New York, this crime drama revolves around the members of the Public Morals Division. It’s a plainclothes unit of the NYPD whose job it is to police vice crimes such as gambling and prostitution — laws on the books that no one wants enforced but that curb all kinds of sin and vice. These cops do what’s been done for the last hundred years — they manage it for the city. This all might come to an end when a war between two factions of the Irish Mob breaks out in the Hell’s Kitchen neighborhood. As the patriarch of two families — his own household, as well as the Public Morals division — Officer Terry Muldoon (Edward Burns) faces a number of challenges as he tries to maintain control over his tightly ordered world. Christine Muldoon (Elizabeith Masucci) is his wife. She is an independent, attractive and tough mother of three. She is very loving but doesn’t take any crap from anyone, even her husband. Muldoon’s partner is seasoned veteran Charlie Bullman (Michael Rapaport). He’s a dedicated family man who goes against his better judgment and this lands him in a difficult relationship with a high-end call girl named Fortune (Katrina Bowden). Vince Latucci (Wass Stevens) is a dapper and cocky plainclothesman, who enjoys all the perks of the public morals division, which usually gets him into hot water with his wife. Sean O’Bannon (Austin Stowell) is Muldoon’s hot-headed and handsome cousin who enjoys attention from the ladies and also likes the benefits of being a Public Morals officer. Petey Mac (Patrick Murney) is the most easy-going and affable member of the division. He loves his job and lives in constant fear he will be bounced from the unit. Jimmy Shea (Brian Wiles) is a handsome, clean-cut cop and the newest member of the team. His arrival in the office puts everyone else on edge. Lieutenant Lonnie King (Ruben Santiago-Hudson) is a smart and stylish lieutenant who also happens to moonlight as the leader of a group of vigilante cops. Pat Duffy (Keith Nobbs) is a fast-taking street urchin. Recently released from prison, he finds himself working as a stool pigeon for Muldoon. Deirdre (Lyndon Smith) is Duffy’s independent and strong-willed sister. She is attracted to O’Bannon, and they develop a complicated relationship. Mr. O (Timothy Hutton) is the head bookmaker for Joe Patton. A nasty, and abusive drunk, Mr. O is married to Muldoon’s aunt, and the father of young cop Sean O’Bannon. Mr. O’s right hand man is Smitty (Kevin Corrigan), a veteran player in the illegal gambling world in Manhattan. Richie Kane (Aaron Dean Eisenberg) is Mr. O’s dangerous and charismatic soldier. Joe Patton (Brian Dennehy) is the aging head of the West Side Irish Mob, who is trying to maintain control of his empire. His volatile son Rusty (Neal McDonough) starts to cause big trouble in Hell’s Kitchen. Recently out of prison, sociopathic Rusty’s impulsive behavior starts a war within two factions of the West Side Irish Mob. The streets of Hell’s Kitchen run red with the blood of the Irish Mafia, as the west side war comes to a head. Muldoon treats Christine to a night on the town, and makes a decision. Duffy gets surprising news from Deirdre. As Bullman’s feelings for Fortune intensify, he’s forced to make a decision about their relationship. First aired: October 20, 2015. What do you think? 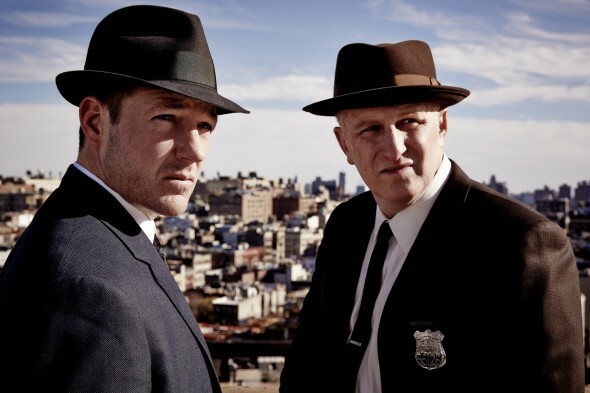 Do you like the Public Morals TV show? Do you think it should have been cancelled or renewed for a second season? Public Morals is a great show. Why has no one brought it back? Emphatically yes this show should be renewed. Please bring it back. It has a great cast and is so well done. This was one of my favorite shows. Please bring it back. Enough of silly shows like the Housewives of ??????? Unbelievable!!! Why was this show cancelled? The show had great writing.I enjoyed the show. Totally agree, this show was very very good, the era it was set it, the personalities (great actors), enough action, suspense, violence to keep me wanting more every week. Bring it back! Even better have another network pick it up like spike or even HBO. It should have been renewed!!! We loved this show. Action packed and edgy. Great period piece. Very well written. Great early 60s period series. Needs to be picked up by another network. Public Morales was great entertainment. The show needs to be seen. Pick it up on another network Maybe better promoting. Needs better exposure. Either way, it is to soon to let it go by the wayside. Great cast of stars! They all play there parts right.